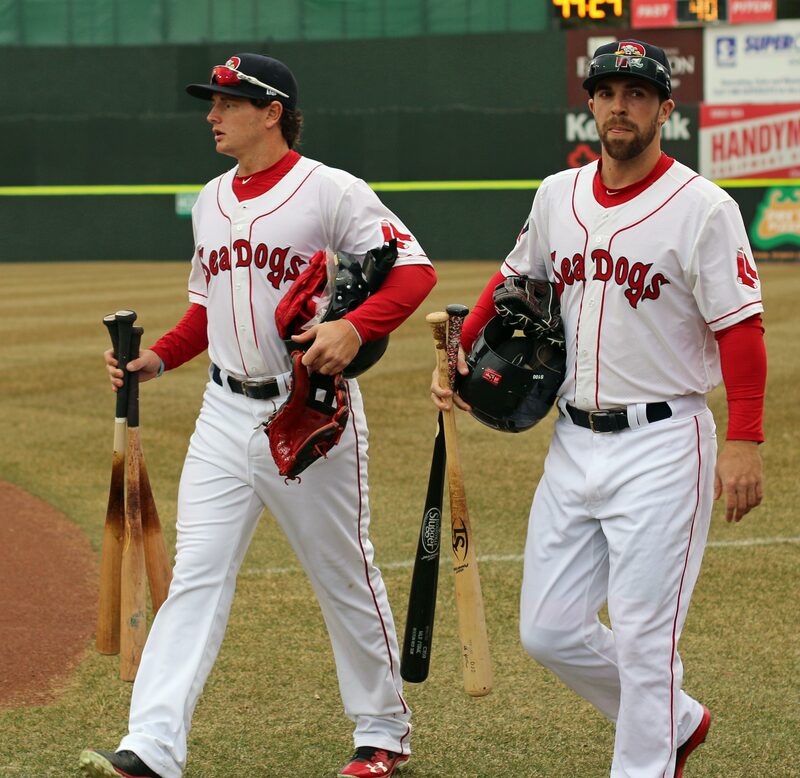 (Portland ME) It was enough to draw me to Hadlock Field even with an iffy forecast. 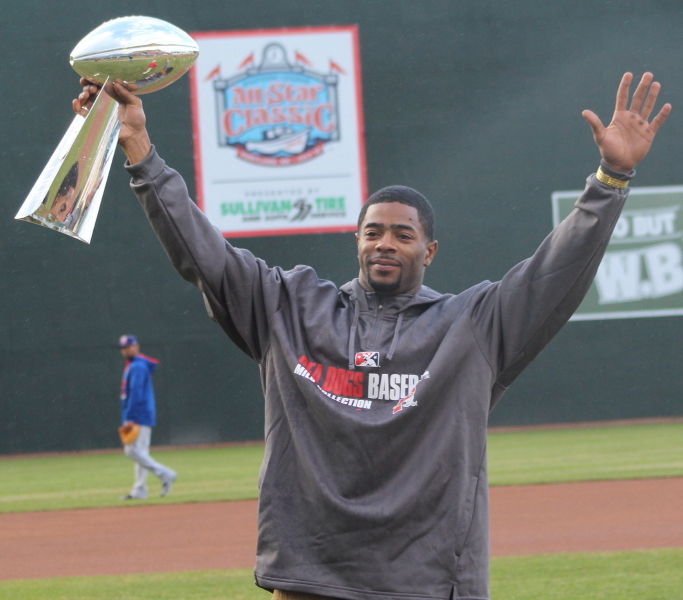 The Portland Sea Dogs brought in Super Bowl hero Malcolm Butler along with the SB trophy on Monday night. 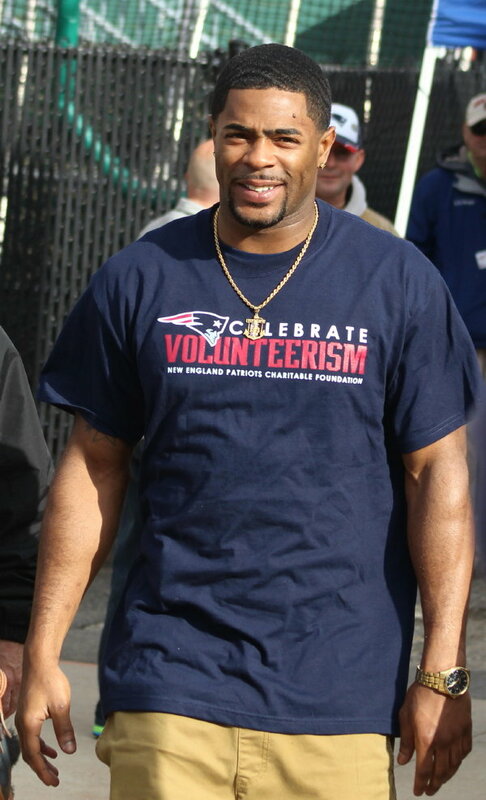 What current Patriots’ fan will ever forget Malcolm’s startling interception with twenty-six seconds left? That game was all but won by Seattle until Malcolm jumped the pass route near the goal line and won the SB for New England. 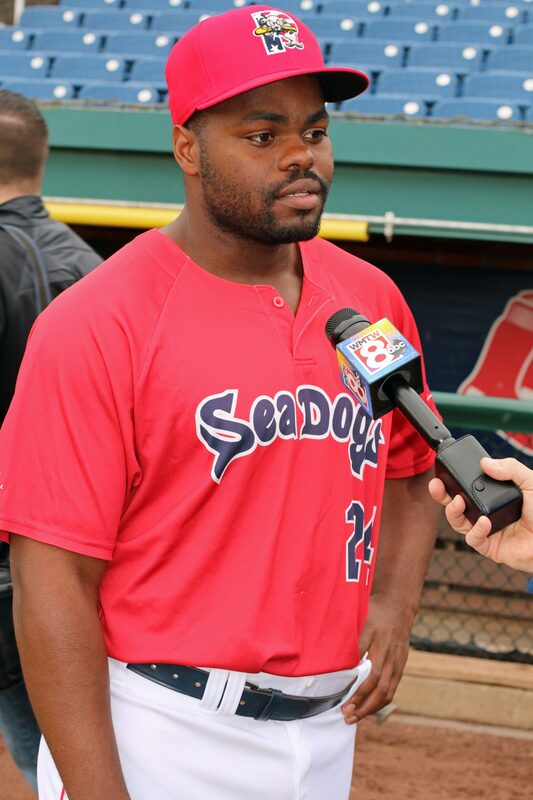 Malcolm arrived at Hadlock at 5:30PM and did some signing for the Sea Dogs in their dugout. Then he was briefly interviewed by a local TV station. 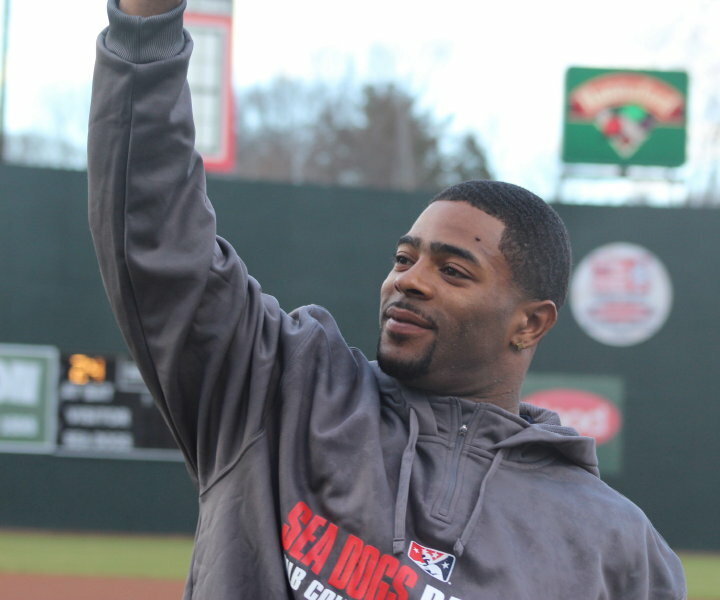 After that he throw out the first pitch and then was given the SB trophy to lift up to the delight of the crowd. Quit a bit of the crowd was missing at the start of the game because they were in the concourse waiting to get Malcolm’s autograph. 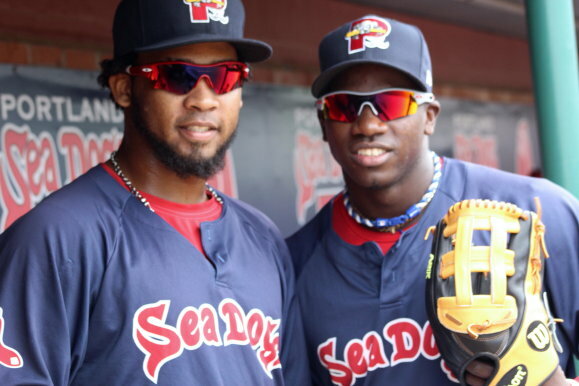 I checked out a couple of prospects while I was there. 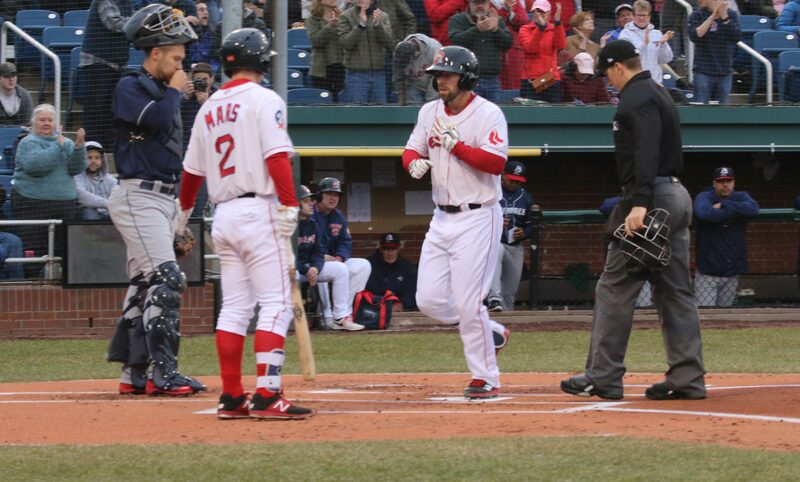 I saw Mookie Betts at Portland last year in April. 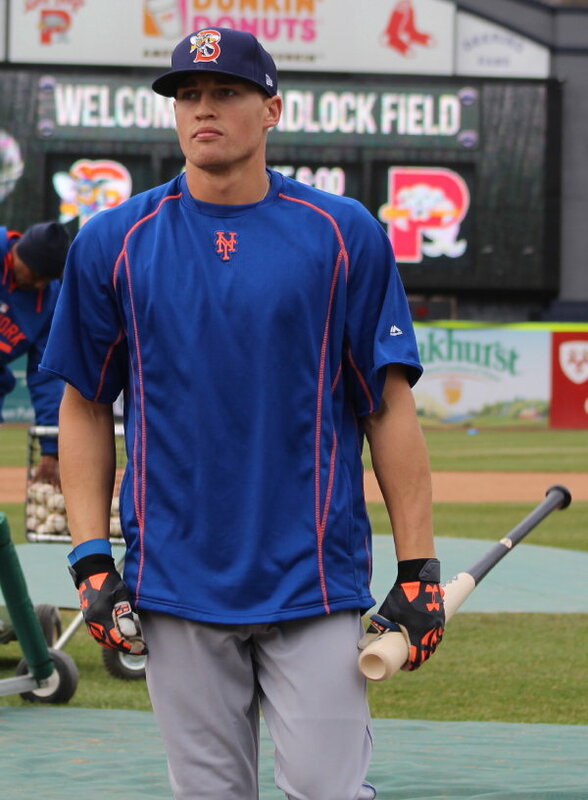 The Binghamton Mets have two first-round selections (Brandon Nimmo – 2011) and (Gavin Cecchini – 2012) on their roster. 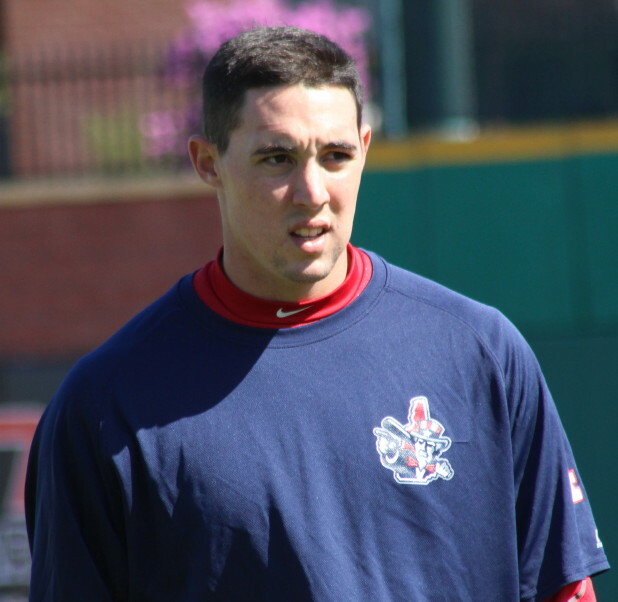 Most of the top prospects for the Red Sox are either at AAA Pawtucket of A Salem (Virginia). 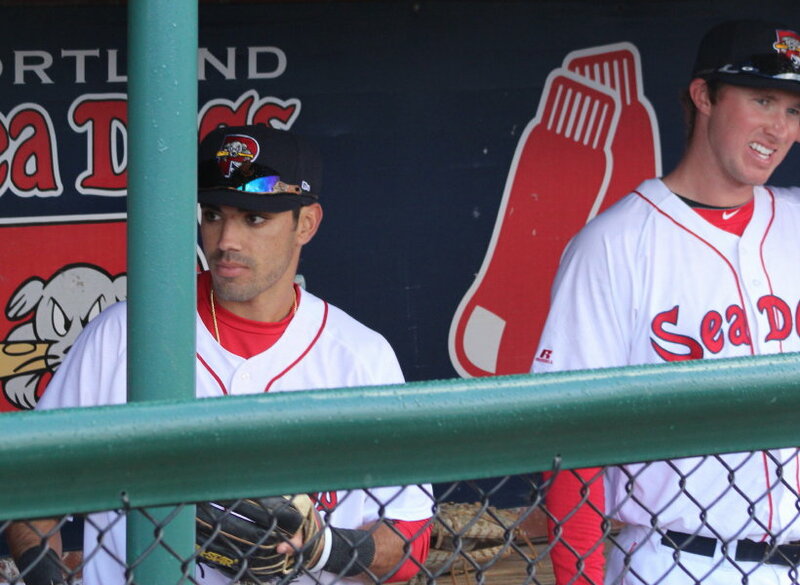 I believe that Carlos Asuaje is Boston’s top-rated player at Portland. The game ended up being called after two innings because of rain. I was pleased to get my pictures before the rain became a problem. Thanks again to Chris Cameron for arranging my visit. (Portland ME) I hoped for better. 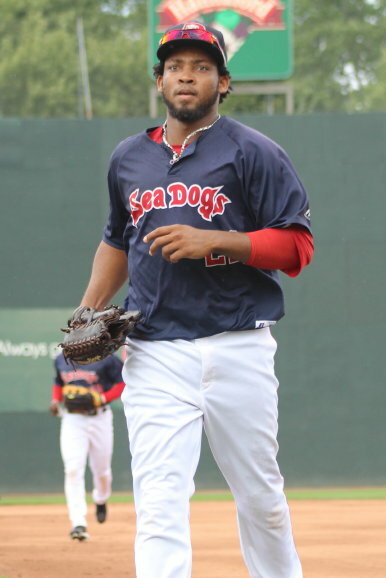 I decided to take in Game Four of the Eastern League playoffs because I wanted to be at Hadlock Field when the Sea Dogs reached the EL finals. 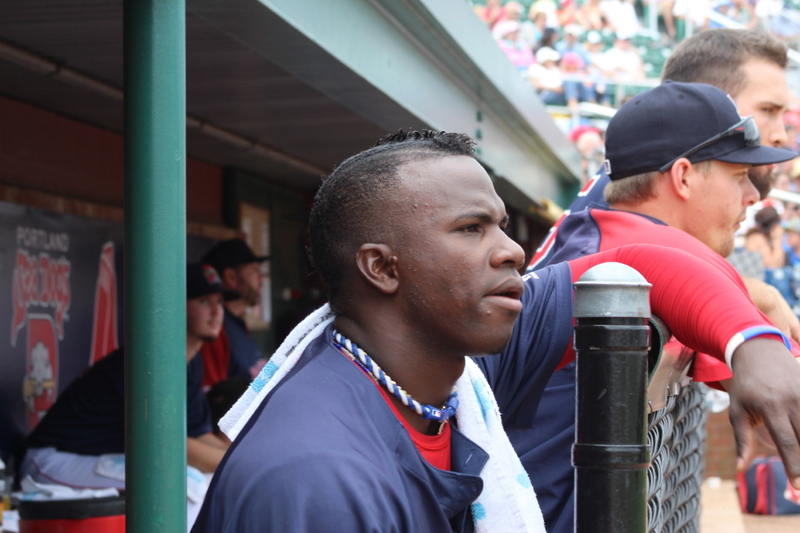 I also wanted to get a good look at Red Sox newcomer Rusney Castillo. 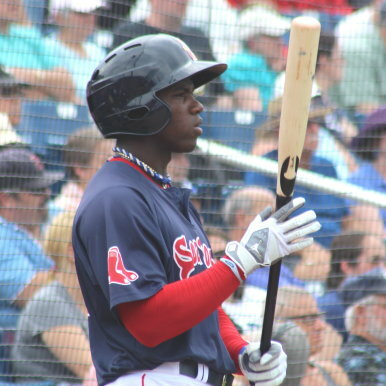 Well, the Rusney Castillo part worked out. 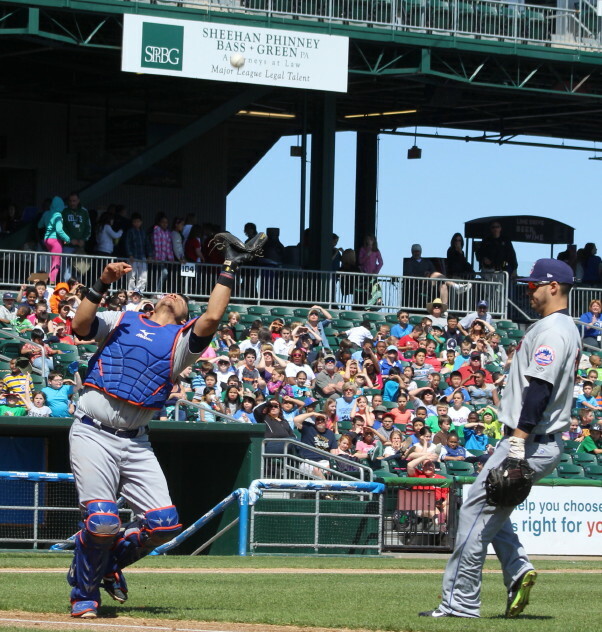 The other part fell apart after Portland starter Mike Augliera loaded the bases with Binghamton Mets in the fifth inning with no outs. 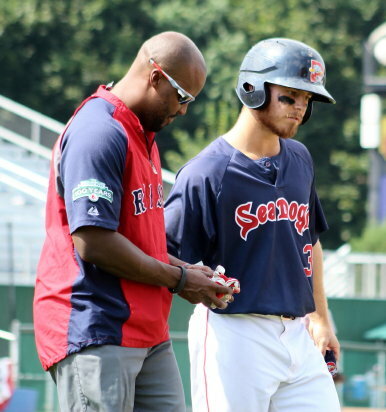 Sea Dogs manager Billy McMillon twice signaled for relief thereafter and found none. Mike McCarthy and Peter Ruiz? Couldn’t have done worse. 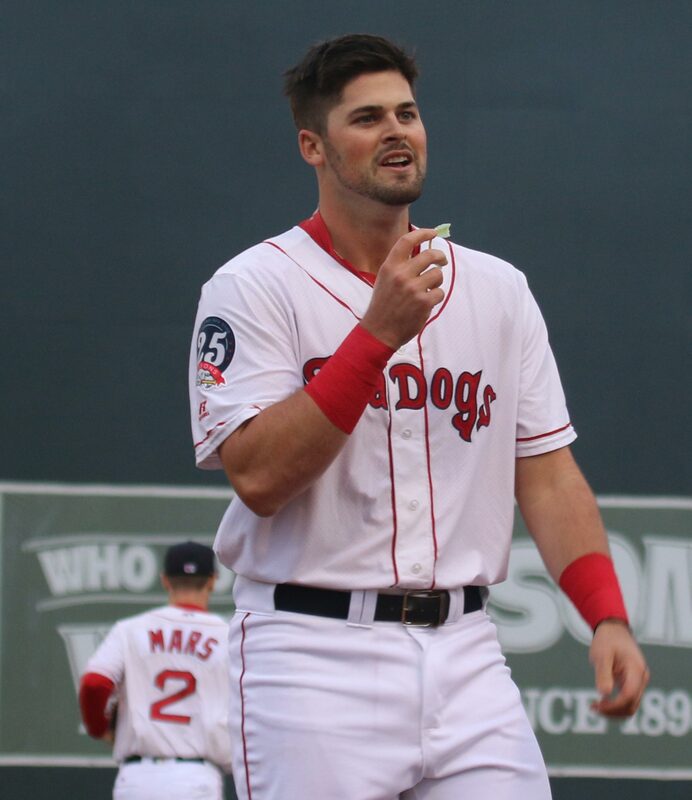 Walks, hit batsmen, and hits, and before you knew it a 2-2 game after four innings was an 11-2 laugher two innings later. The final score was 11-4. 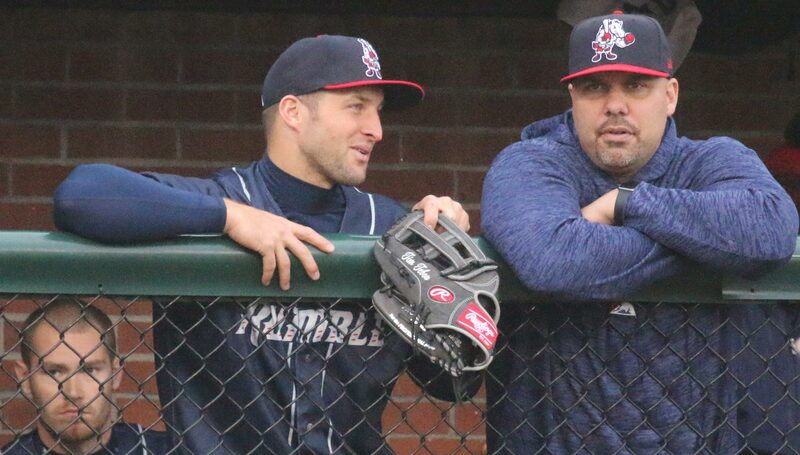 It was a disappointment but there is tomorrow in this best-of-five series and that decisive game will be played at Hadlock Field. 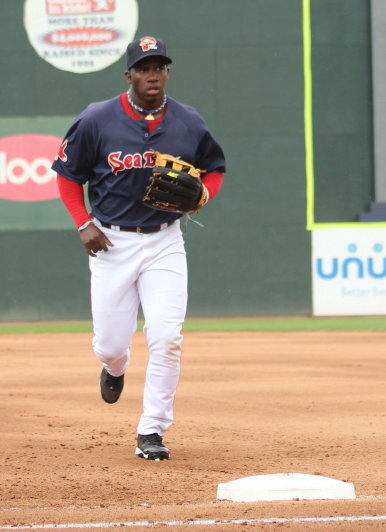 I did get a good look at recently signed ($72 million) Rusney Castillo. I would describe him as short, thin-waisted but powerfully built. He never got on base in this game so I never got a chance to see any of the blazing speed he apparently has. 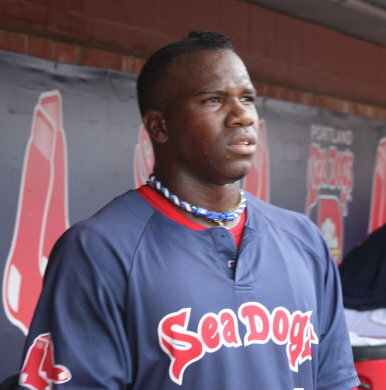 I am sure that Rusney is a little bit dazed by all that has happened. 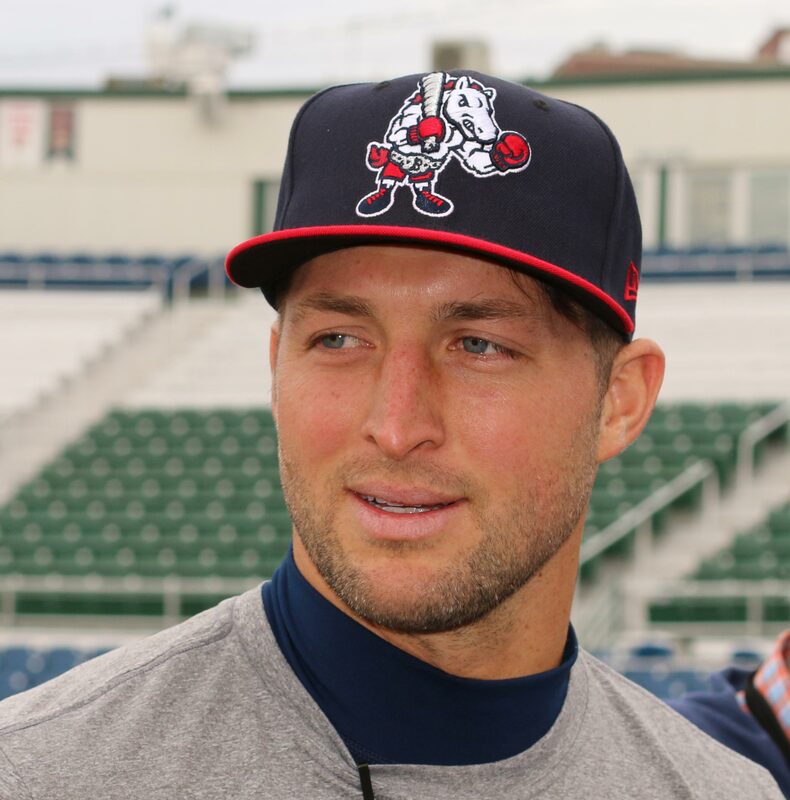 He signed the big-money contract on August 23rd and then went to play in A ball in the Gulf Coast League. Next he joined Portland. 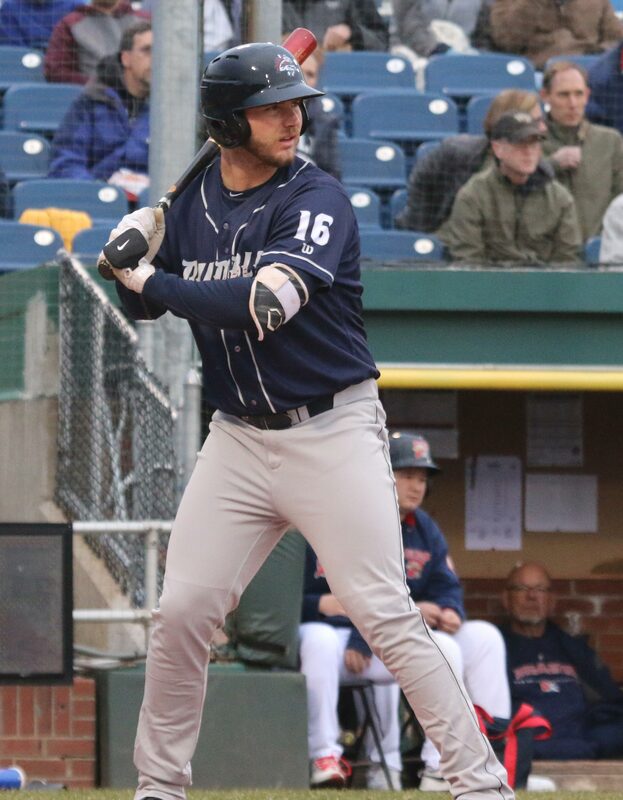 That, so far, has meant two games in Binghamton (NY) and a seven-hour bus-ride to Portland for a 6PM game on Friday and a noon game today. 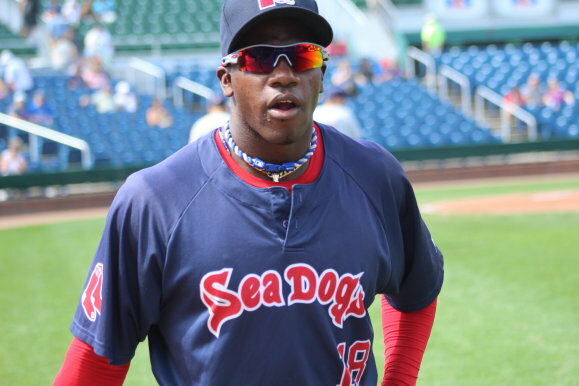 I suspect after tomorrow Rusney will move on to Pawtucket for the International League finals versus Durham. 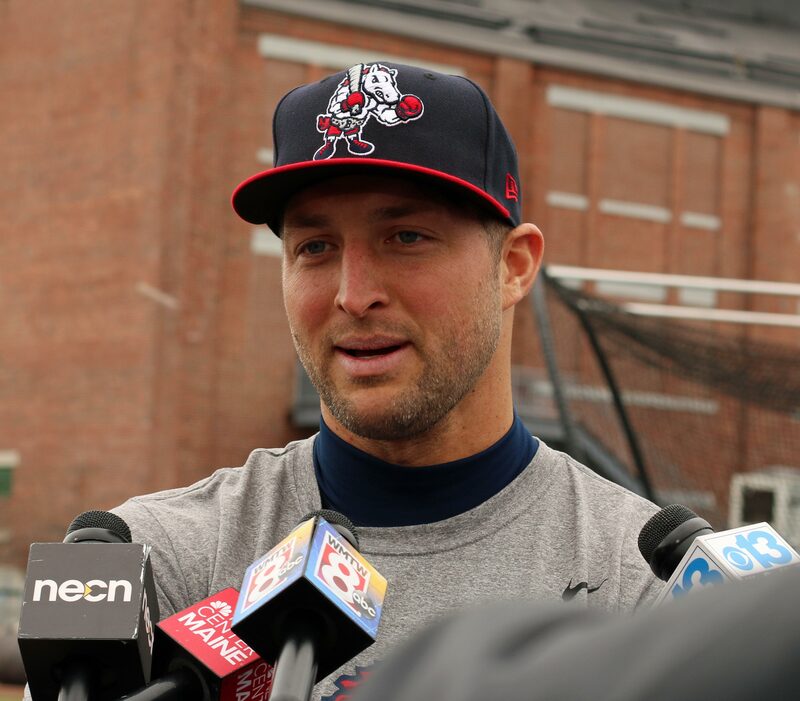 At least it has given a lot of Red Sox fans a chance to see a highly-publicized player up close before he starts his career in Boston. 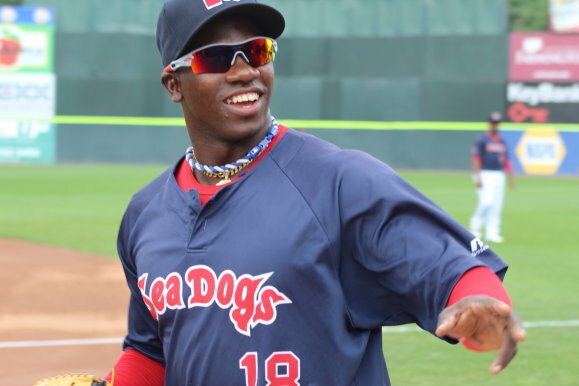 Rusney smiled at the fans pre-game but didn’t sign autographs. 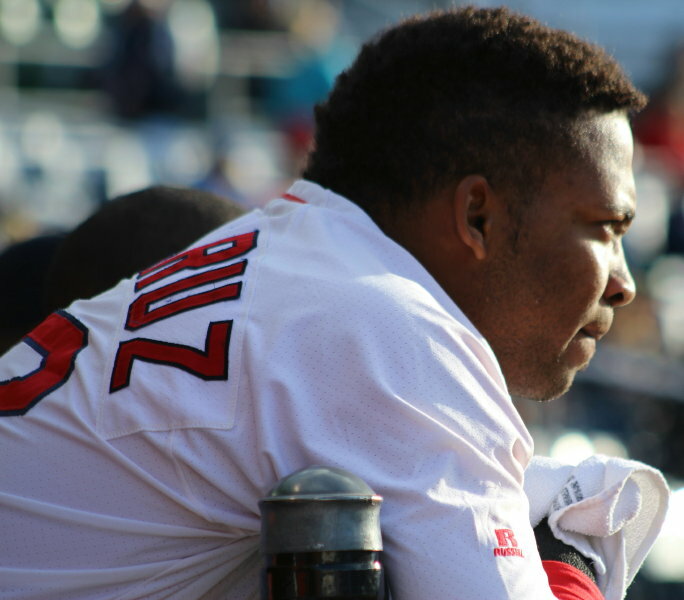 He seems to have bonded with leftfielder Keury De La Cruz during his short stay in Portland. 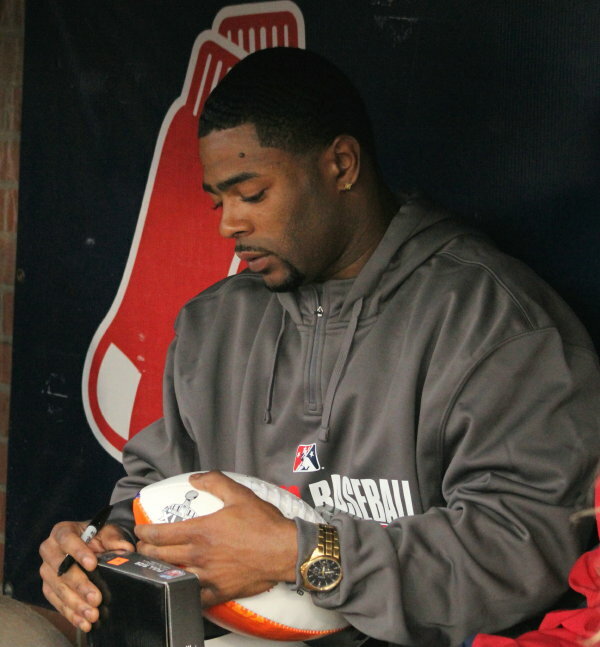 Fortunately for me, Rusney spent his in-the-dugout time down the end where the photographer’s were. That gave this amateur plenty of chances to get a decent picture of him. Did it make a difference in the game? I’m not sure but when I arrived, 1 1/2 hours before game time, the B-Mets were taking batting practice. 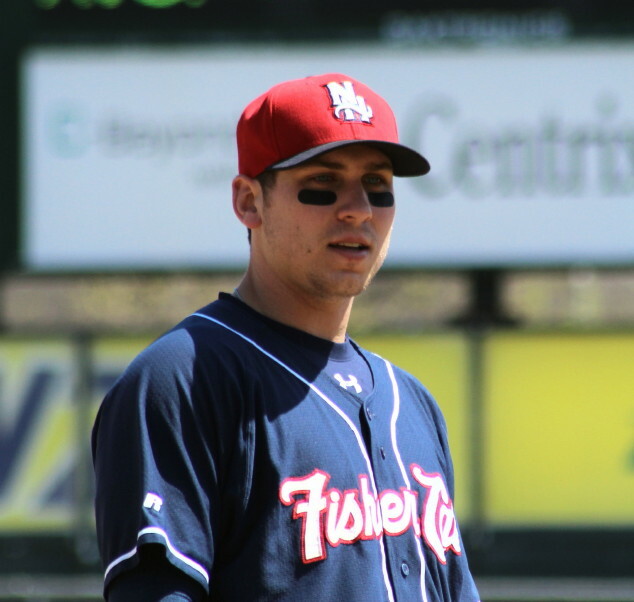 The team had just four hits in Friday night’s 6-3 loss. Normally you don’t see a team taking batting practice before a noon game, but with elimination pending batting practice was called and it paid off with thirteen hits and eleven runs. 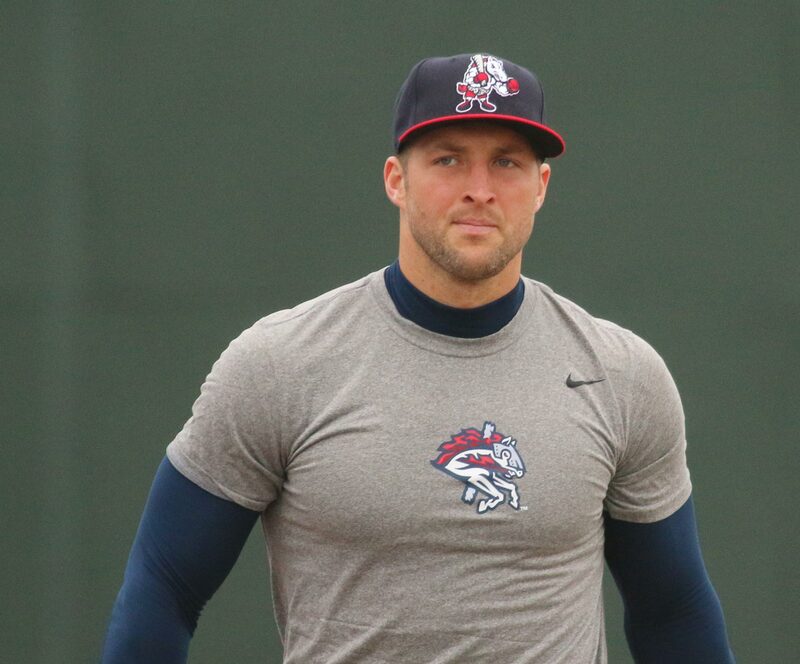 Maybe Portland should take BP tomorrow? 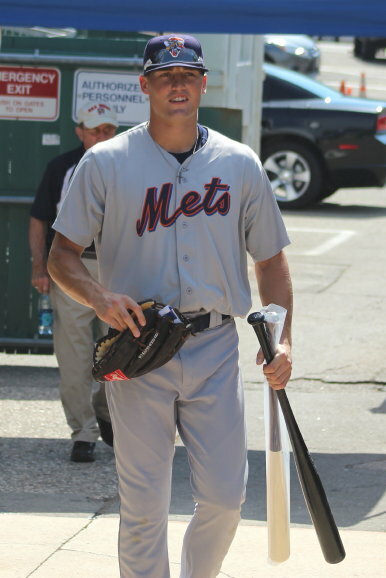 I succeeded in getting a picture of the B-Mets Brandon Nimmo. 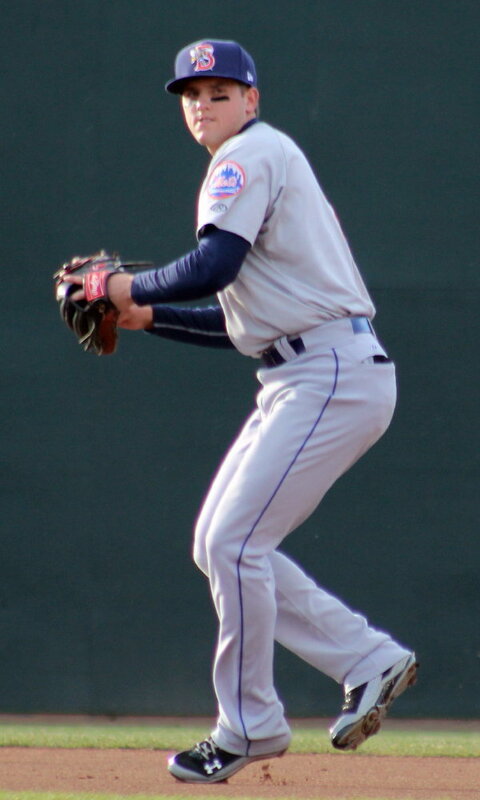 Brandon was a first-round pick of the Mets in 2011. 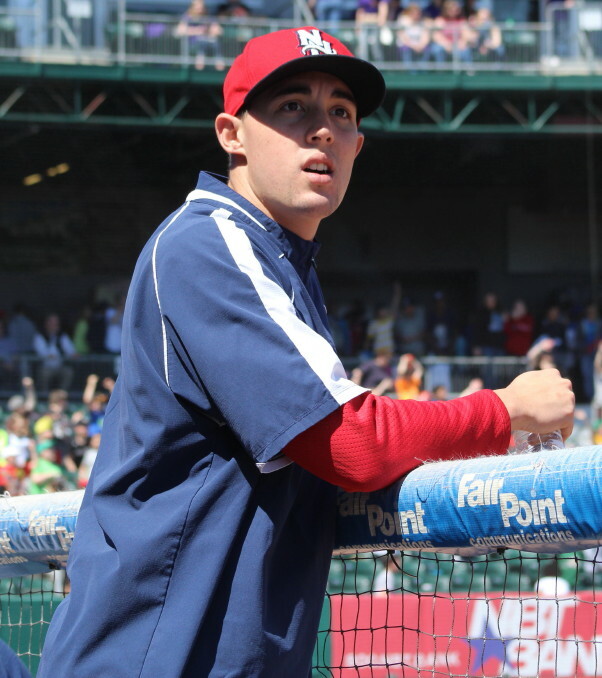 The 21-year-old third baseman can hit. He is from Cheyenne, Wyoming. 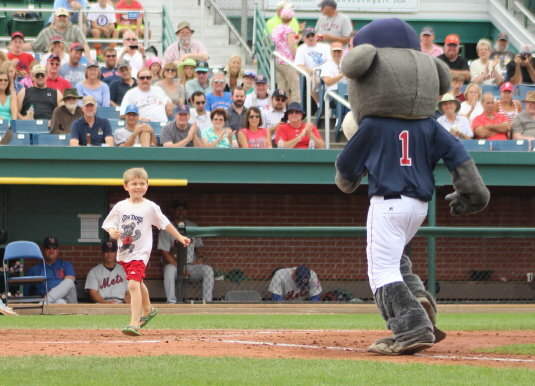 I have noted the running skills of Sea Dogs mascot Slugger every time I’m at Hadlock. 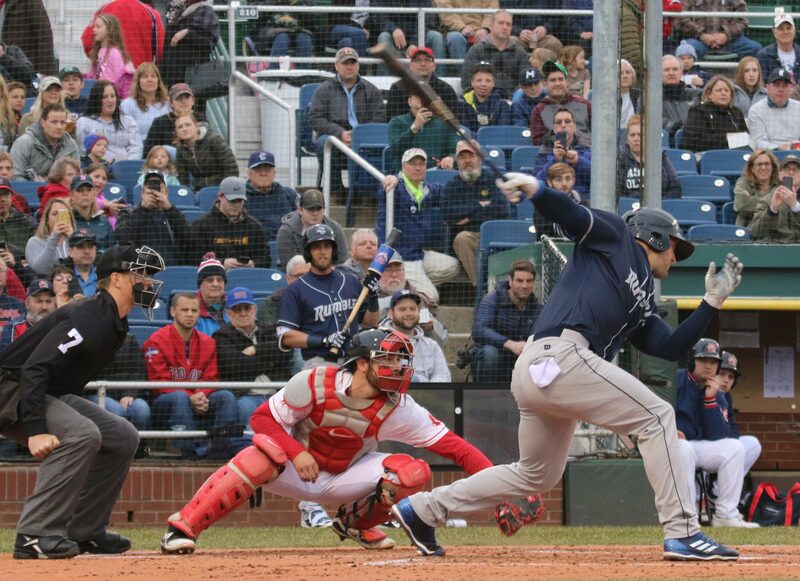 I always like his chances when I see the size of his around-the-bases running opponent. 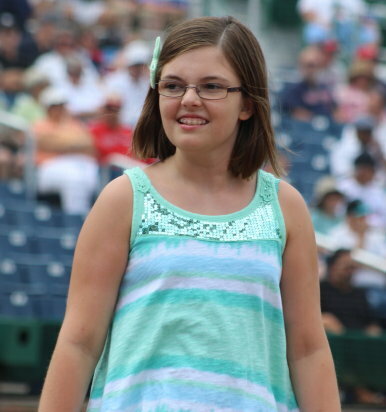 They’re always small but never small enough that they can’t beat the easily-distracted Slugger. 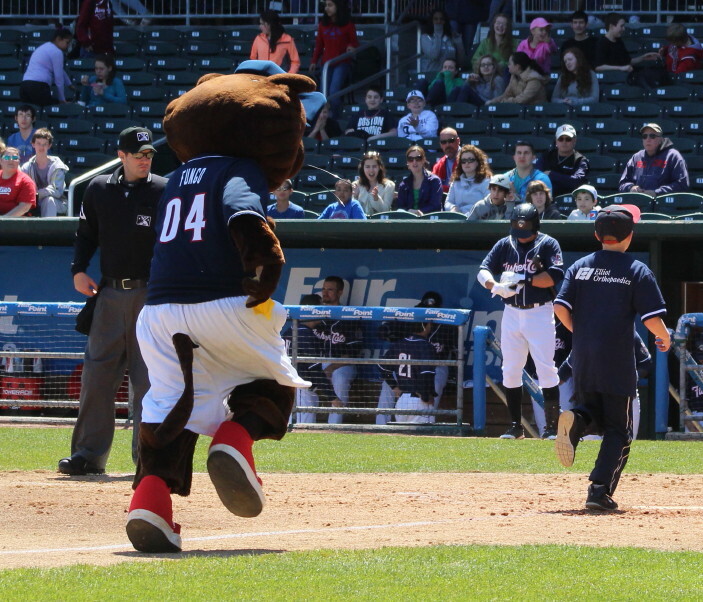 Today the very social mascot found a need as the race started to get some batting tips over by the Binghamton dugout. But he did and off raced his diminutive, full-speed opponent to a big lead. 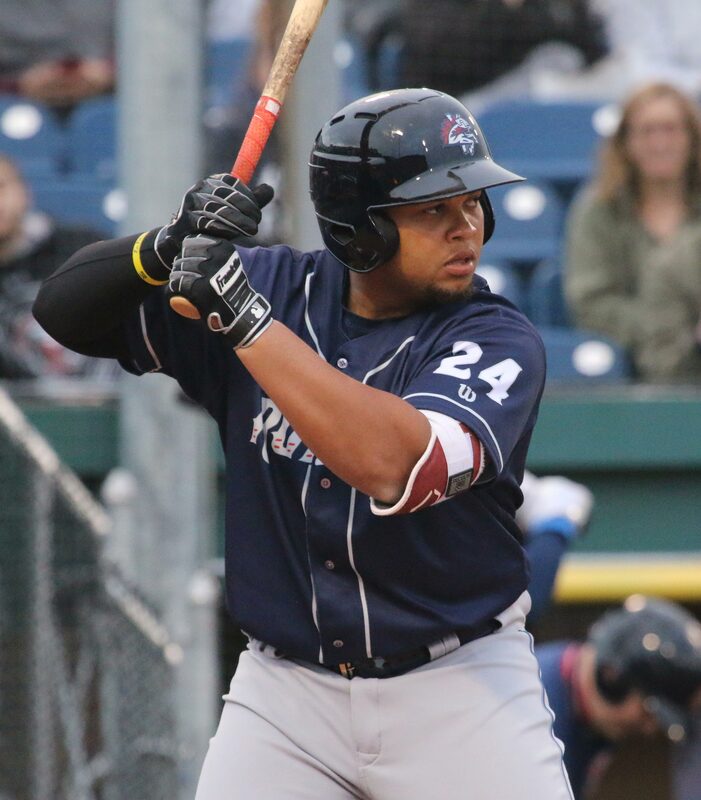 Slugger was great once he was underway on the bases but that early chat did him in. Why would he need batting tips anyhow? 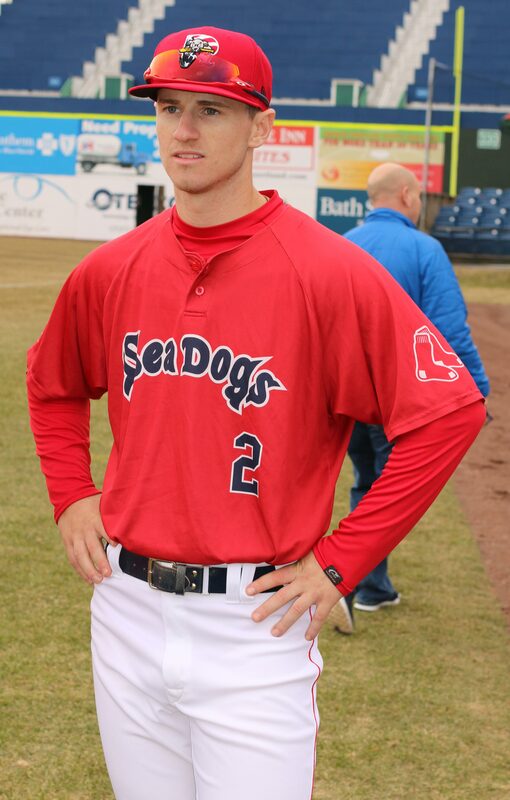 My suggestion to the Sea Dogs management would be that his uniform number should be changed from 1 to 2 because that is where he’s finished every time I’ve watched. 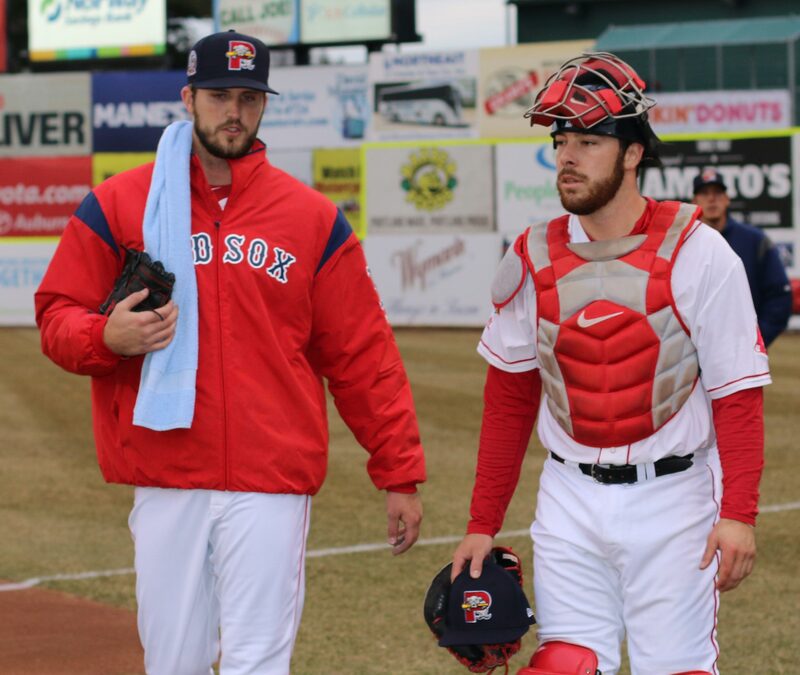 Seriously, another good time at Hadlock. The visit arranged for me late Friday night by the always-affable Chris Cameron. I really appreciate it. A crowd of over three thousand was on hand. The game was originally scheduled for 6PM. Changing the time to noon avoided the showers forecast but probably forced some fans to miss the game. I was surprised by how quiet the crowd was. I could understand it after the team was down 11-2 but not before that. 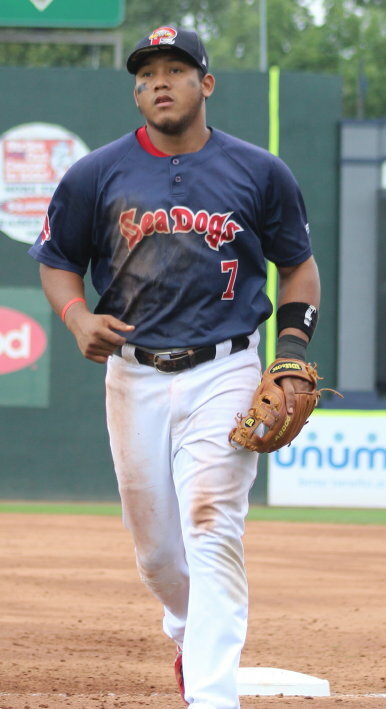 I think that the Sea Dogs could use the boost. 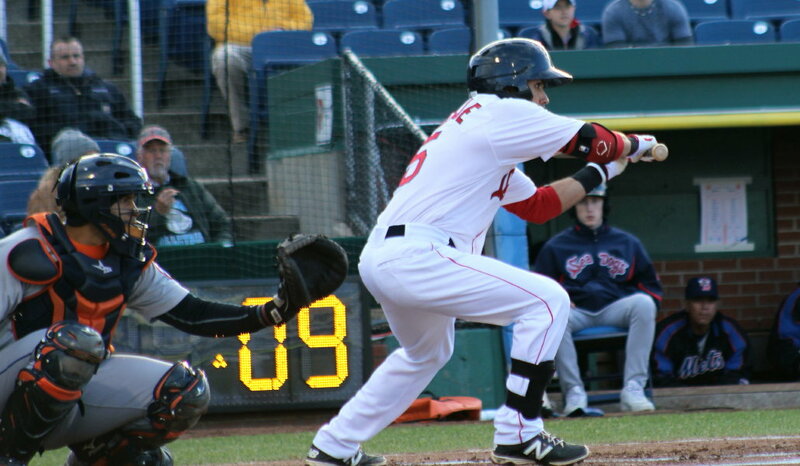 Sean Coyle was hit by a pitch. I think on the forearm. 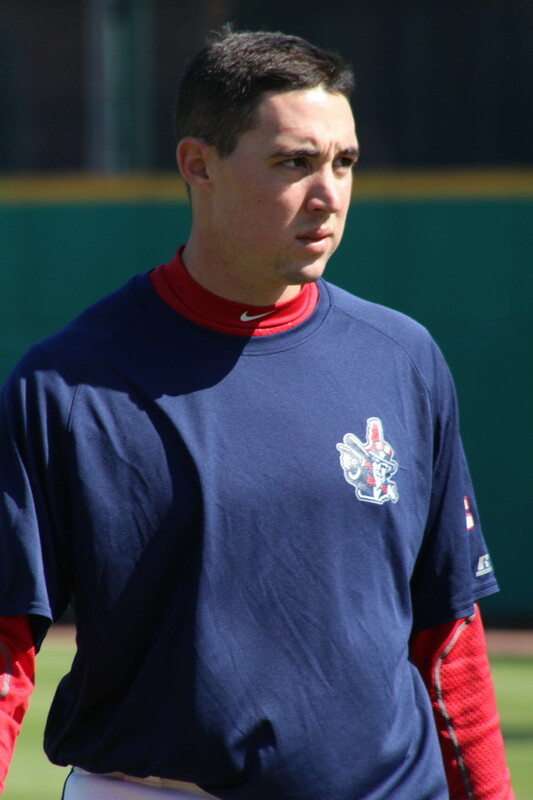 I predict that Sean will start 2014 at Pawtucket. 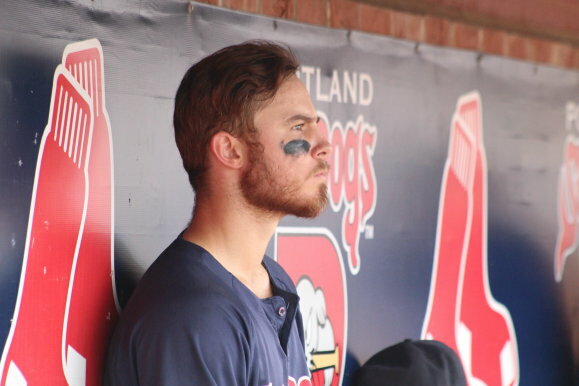 Playing second base isn’t going to get him to Boston any time soon but maybe he’ll be a multi-position player like Brock Holt and Mookie Betts. 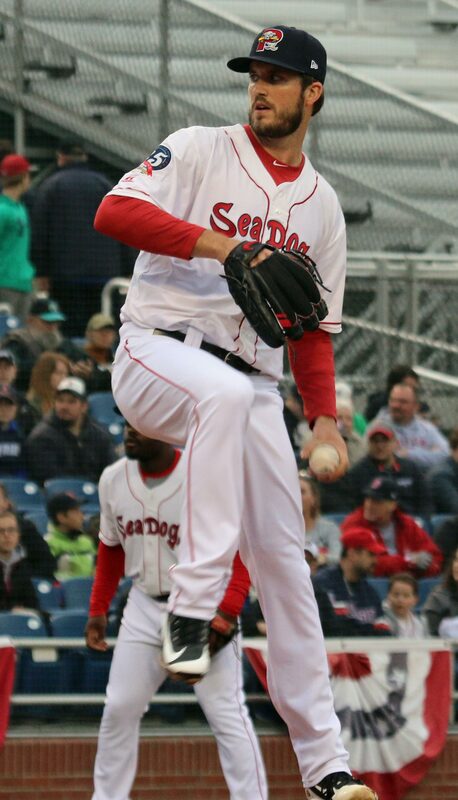 Good luck to the Sea Dogs tomorrow in Game Five. 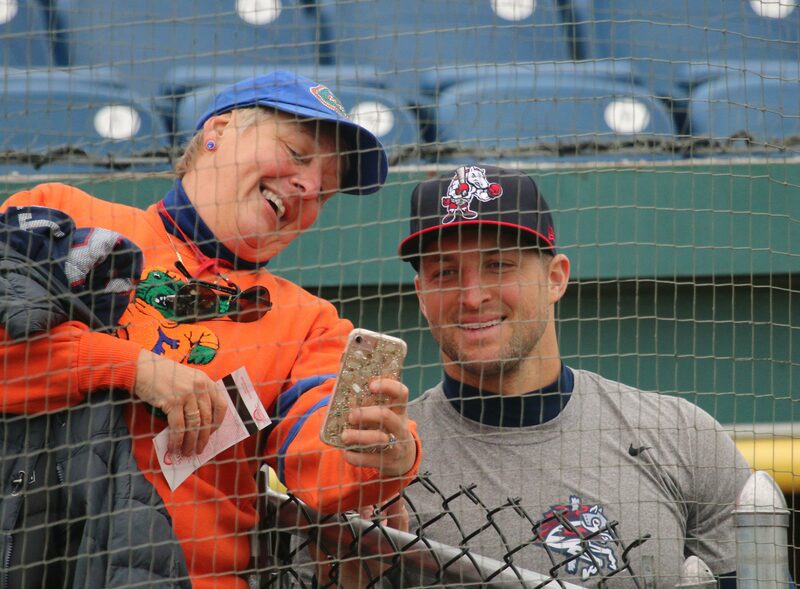 (Manchester NH) I saw the Binghamton Mets defeat the New Hampshire Fisher Cats, 6-0, on a Wednesday morning/afternoon Eastern League game. The weather was beautiful with plenty of Manchester (NH) school kids on hand for the 10:35AM start. 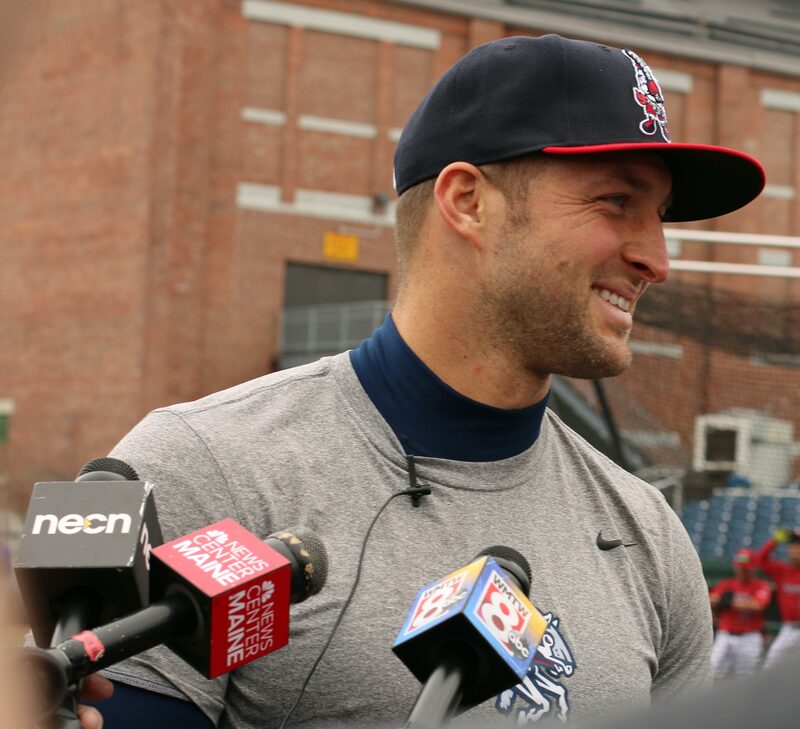 New Hampshire is the AA minor league team of the Toronto Blue Jays. 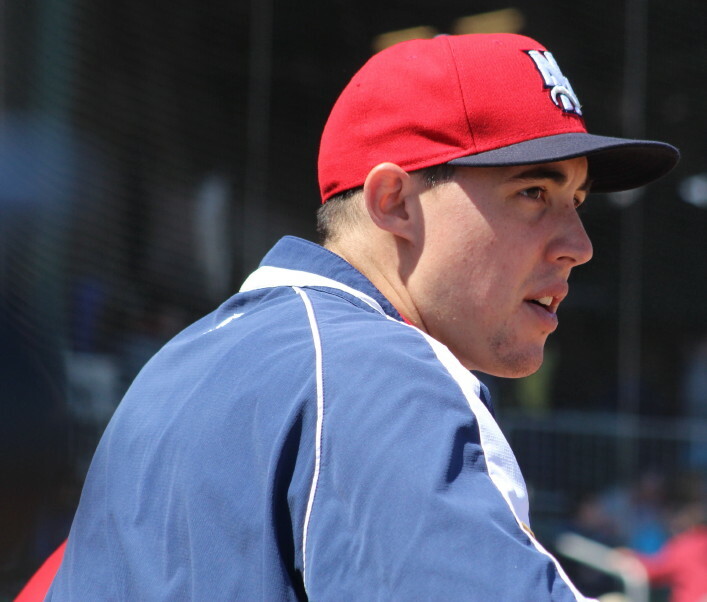 With a little bit of homework I learned that the Blue Jays #1 prospect, pitcher Aaron Sanchez, was on the New Hampshire roster. 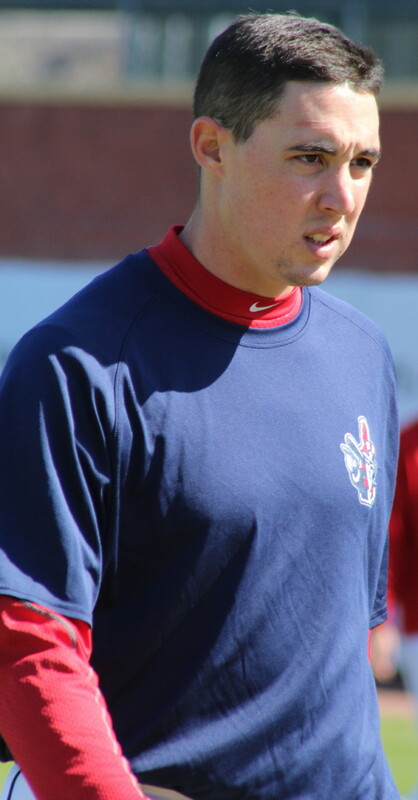 Pitchers are the most challenging to get pictures of unless they are pitching. 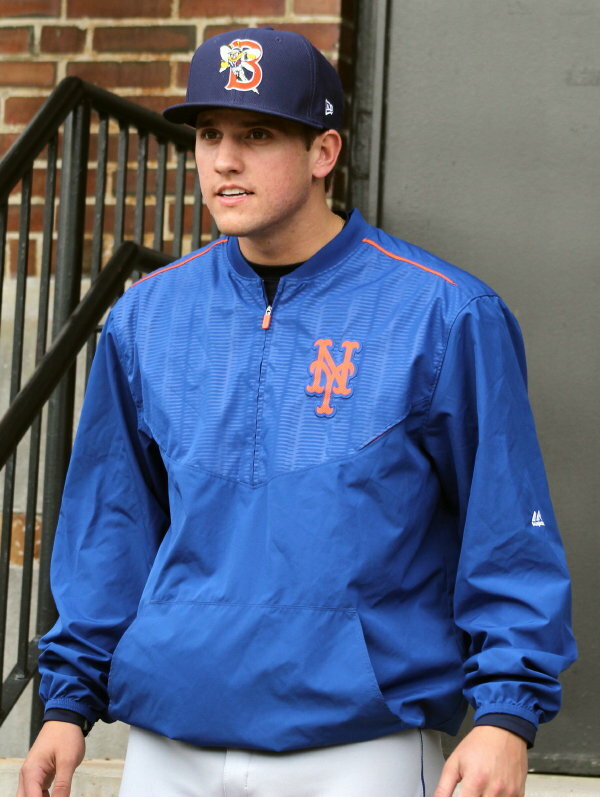 Otherwise they’re usually out in the bullpen far away from any pictures ……… unless they’re pitching the next game. And that was the case today with Aaron. 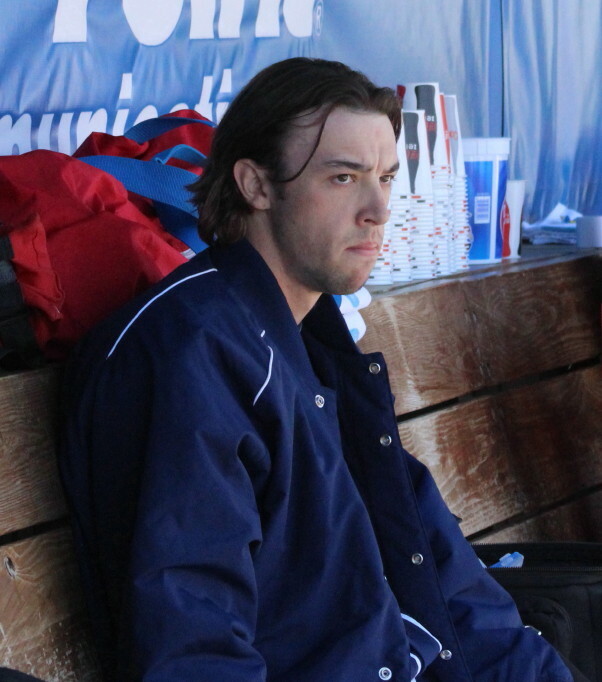 He was scheduled to pitch tomorrow (Thursday), so he warmed up briefly before the game and then was in the dugout. 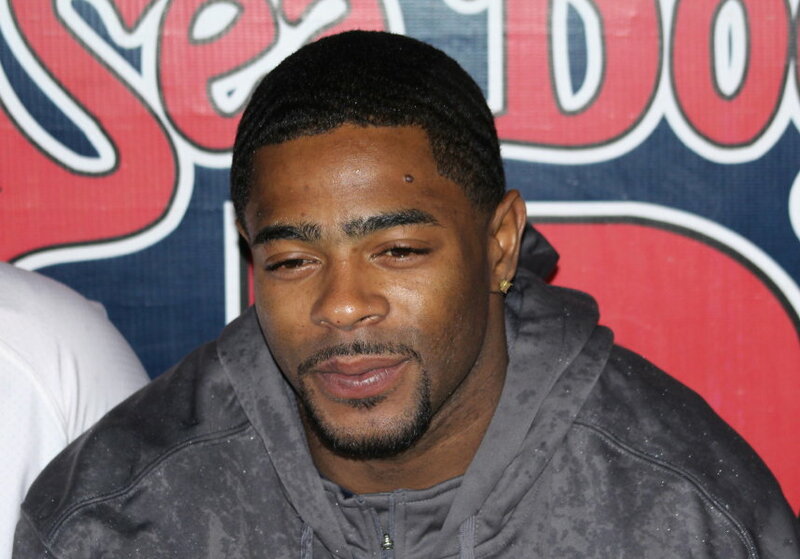 Aaron was drafted in the first round by Toronto in 2010. 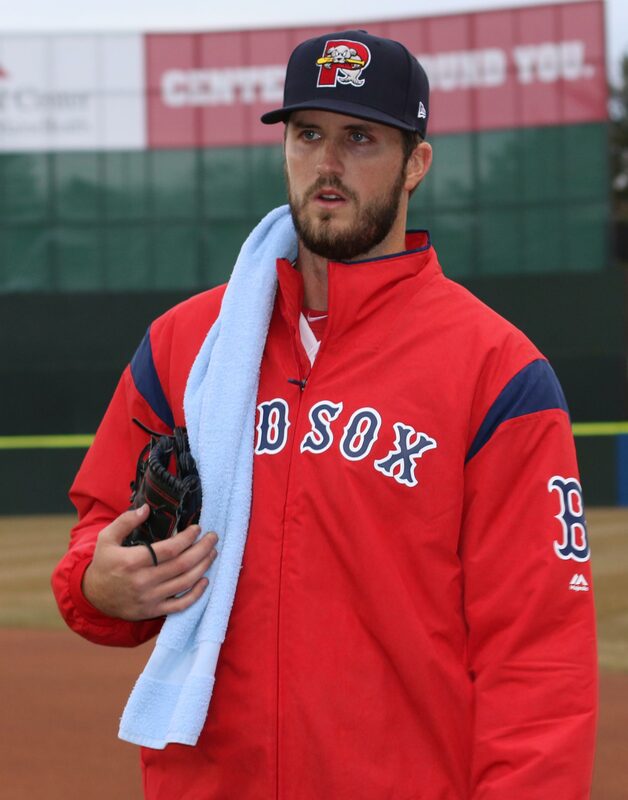 The 21-year-old can get over 95MPH with his fastball and is developing pitches to go with the heater. 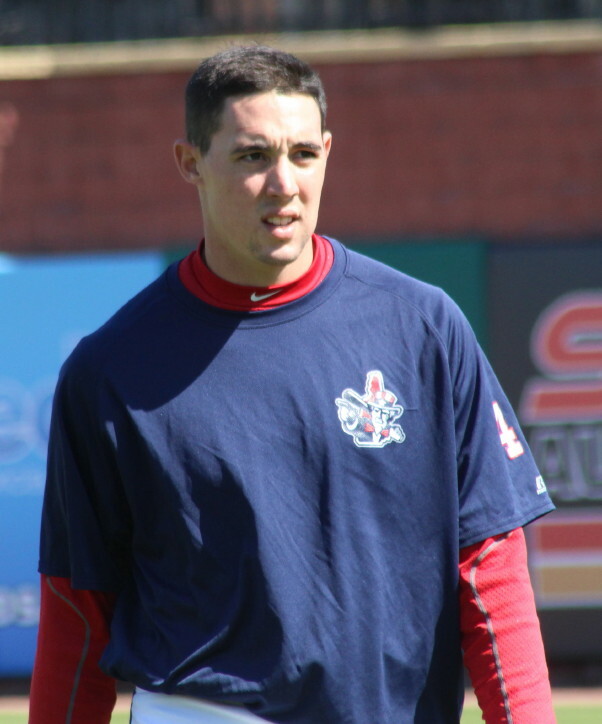 Similar to Mookie Betts of Portland, Aaron should be at AAA before the 2014 season is over. 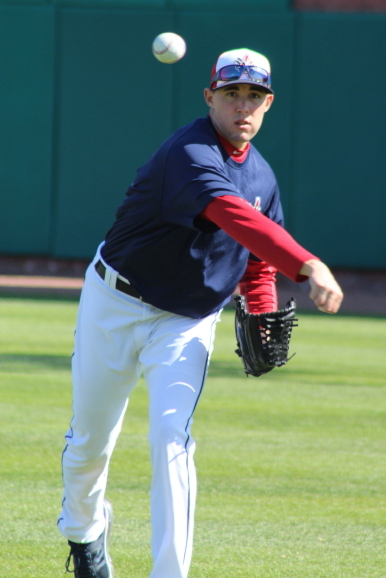 Even though Aaron didn’t pitch, I saw a pretty good pitcher in Binghamton’s Greg Peavey. 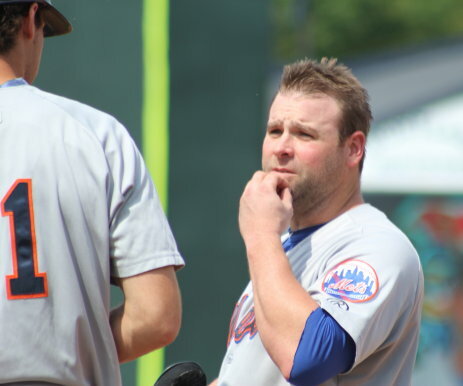 The Mets rightly pitched a complete game two hitter. 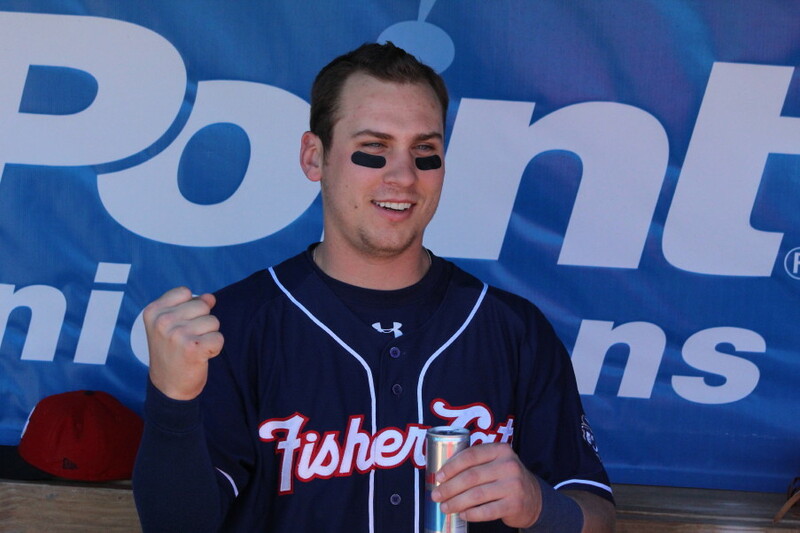 Fisher Cats starter Casey Lawrence served up a 3-run homer down the rightfield line to Brian Burgamy in the third inning. 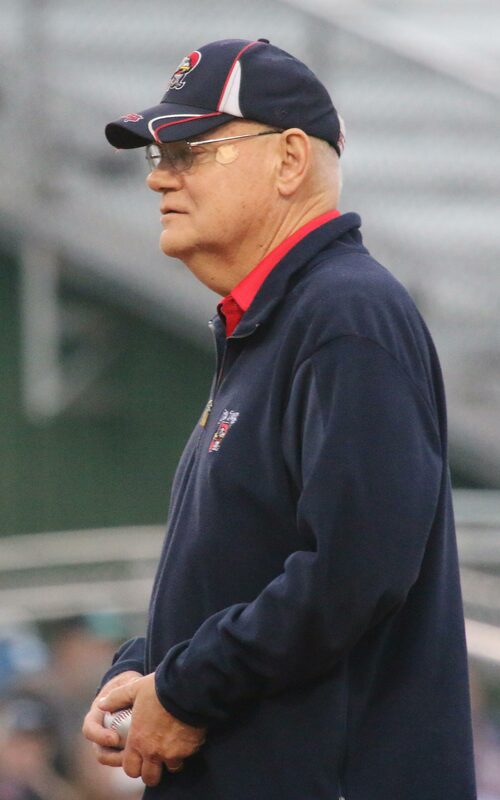 That shot provided more than enough runs for Greg Peavey. 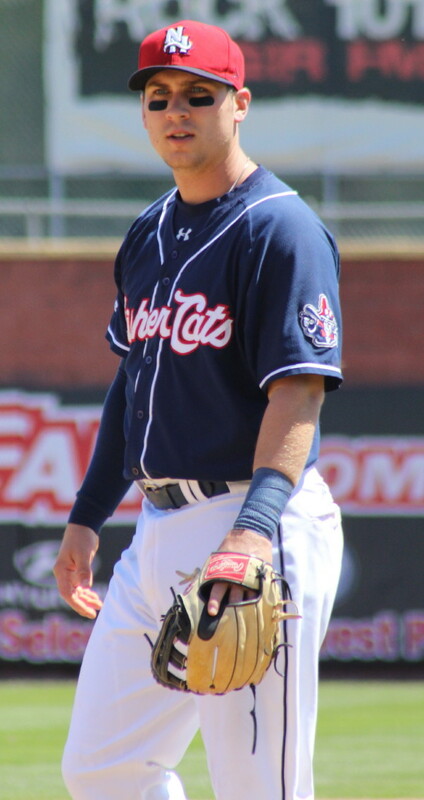 Third baseman Andy Burns is off to a nice start with New Hampshire so I took a number of pictures of him. 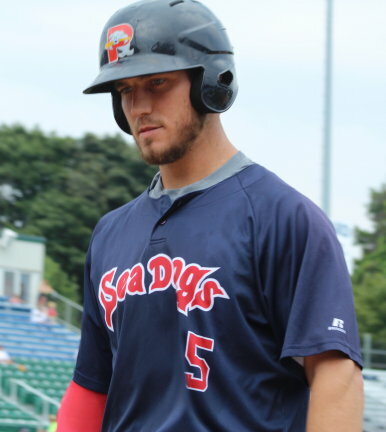 I was disappointed with the efforts of Fungo the mascot. He tried to outrun one of the kid spectators and didn’t come close to getting the job done. The big problem was the bad start. 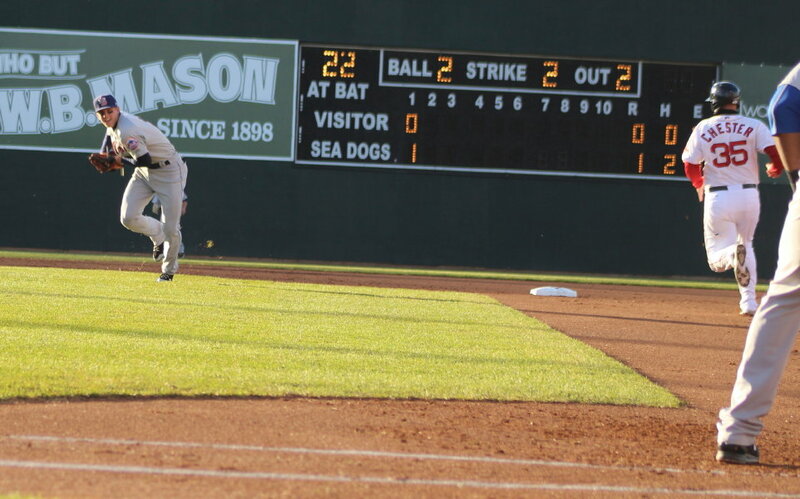 The kid was so confident that he was looking over his shoulder as he went from third to home. They had a shirt shoot that stirred plenty of excitement. I have seen that done at the TD Garden but not at an outdoor event. 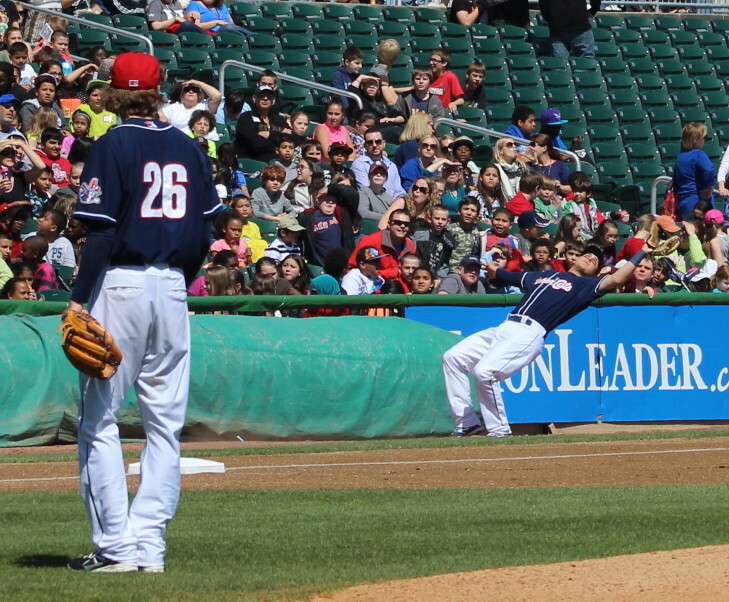 Shortstop Kevin Nolan made a nice stop and throw on a ball deep in the hole. 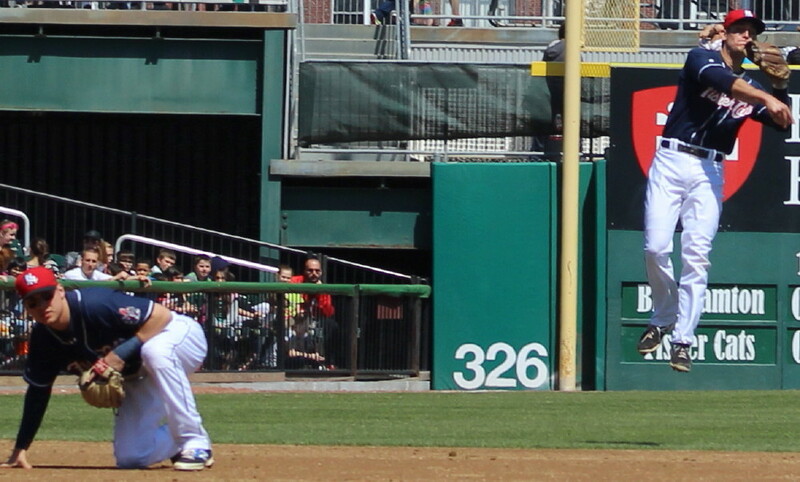 Andy Burns nearly misjudged a foul popup. He came in for it and then started fading back eventually ending up on his back after he made the catch. 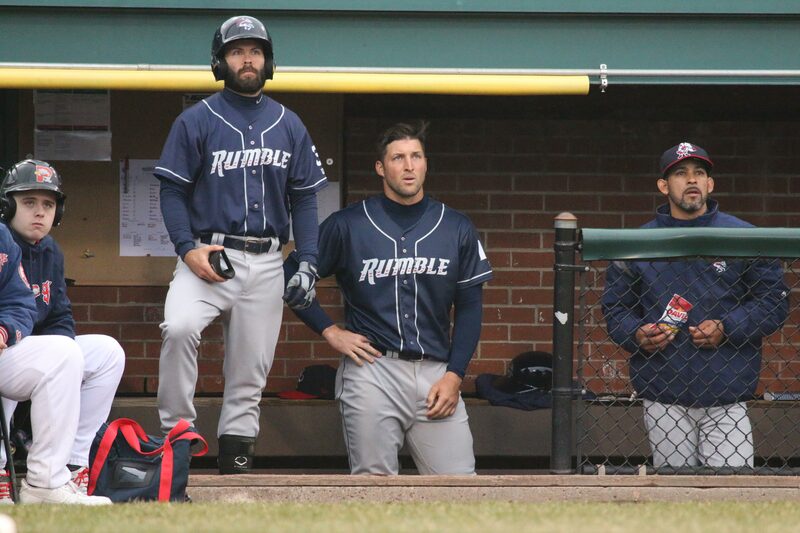 His teammates were merciless to him when he returned to the dugout. 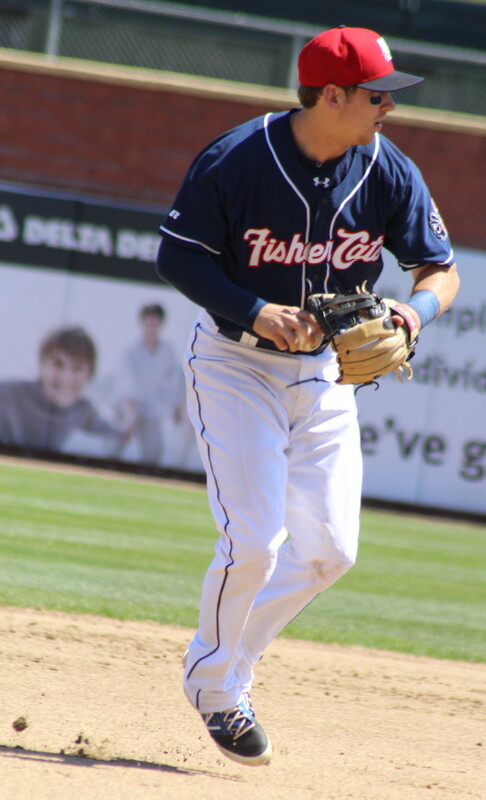 I continue to recommend a visit to a minor league baseball game at the home of the Fisher Cats, Northeast Delta Dental Stadium. The prices are good and the entertainment is constant. 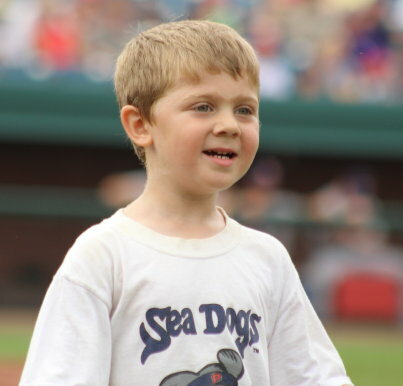 You can get close to the action and you may well see one of the future stars of major league baseball. Thanks again to media relations boss Tom Gauthier for arranging for my visit.